Lotto.in Lottery (Lotto India) provides an online portal for lottery and a betting platform with real lottery tickets for Indians. The website is supported in five different languages including English, Bengal and Hindi. It is pertinent to note that the lottery service does not offer any playing options, just the standard lottery rules for players. 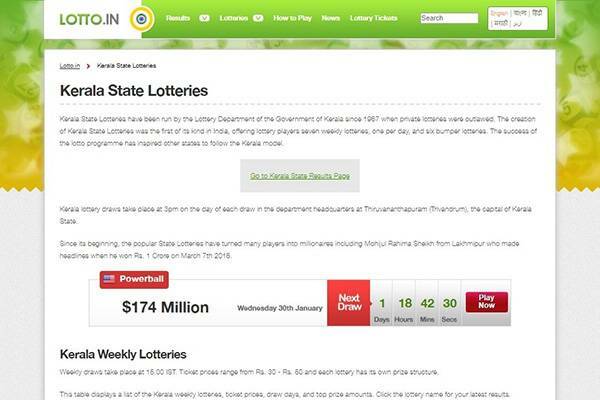 Considering the fact that it is an Indian based lottery website, it is expected that the lottery service supports the Indian rupee, which is also the only supported currency on the platform. The lottery service offers 12 lottery games to players on its website. The 12 games are Powerball, Mega millions, Euromillions, UK Lotto, Playwin Lotto, Thursday Super Lotto, Saturday Super Lotto, Thunderball, Jaldi 5, Jaldi 5 Double, Keno and Punjab Lottery. UK Lotto, Powerball lotto, Megamillions and Euromillions are the 4 main lottery games on the site. They all have bi-weekly draws while Thursday Super lotto and Saturday super lotto are drawn once in a week. 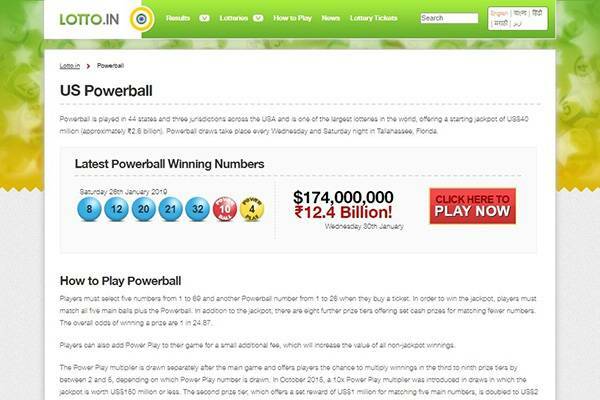 The Powerball game drew on Wednesdays and Saturdays currently has the biggest prize win with a jackpot of ₹17.5 billion which is equivalent to $269,000,000 at the current rupees to dollar exchange rate. Except for the Thursday super lotto and Saturday super lotto which have a 90days time limit within which winners are expected to claim their wins before it becomes void, the wins from the UK Lotto, Powerball lotto, Megamillions and Euromillions are automatically paid into a user’s account. 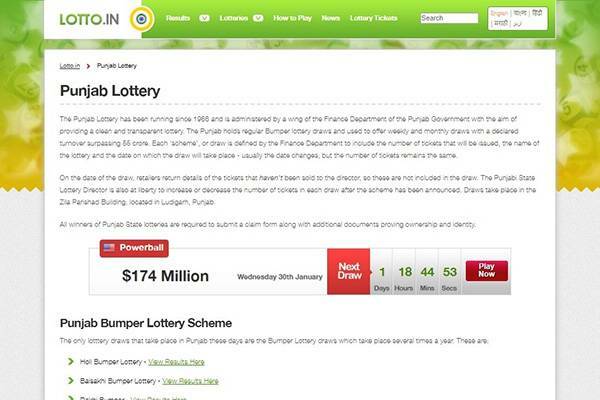 Playwin lottery which includes the Thunderball, Thursday Super lotto and Saturday super lotto was launched in 2001 and it was the first Indian lottery to support the sale of online tickets. All these lotteries are run and regulated by state government organisations. 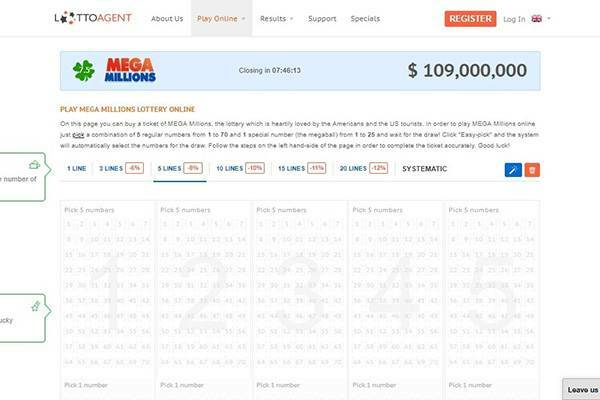 There is reportedly a Lotto in app available for iOS devices though it is unknown if there is mobile support for the Android platform and the potential usefulness of the app. Lotto.in occasionally gives users certain bonuses like the typical ‘buy 1 one get 2 free’ types of bonuses. Lotto In supports five methods of payments – Diner’s Club, MasterCard, Playwin, Skrill and Visa card. Additionally, the lottery service charges no winning commission or transaction fees, still, there are no discounts and winnings are subject to taxation. However, taxation usually depends on the game and the amount won in that case. There is currently no minimum withdrawal limit in a lottery account and users receive notifications on transactions and other updates through SMS and emails. 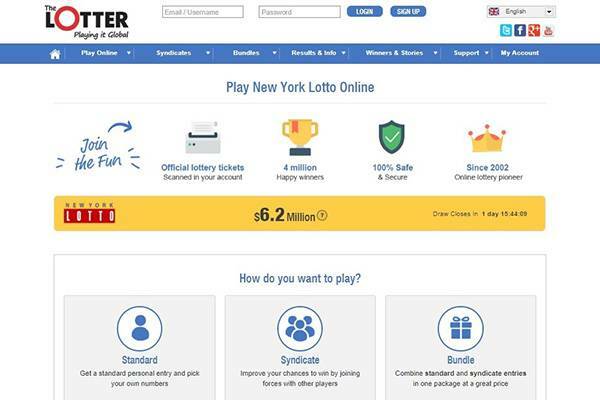 Lotto In has a semi-functional FAQ page that focuses on questions concerning international lottery games. It is noteworthy that the page isn’t even a stand-alone page as it is categorized under ‘Lottery laws’ on the website. While lotto.in is an affiliation site, and so doesn’t have registered users. But having just one contact option – email – does seem too few. A friendly contact form or any notion of working hours would be helpful. The lottery agent that users who want to purchase tickets are redirected to does have a complete FAQ page, but that is too many clicks away. Is lotto.in Lottery legitimate or fraudulent? The lotto In website is secured by Google Safebrowsing with an Alexa ranking of 446,711. The site has been in operation for about 13 years now and it receives about 9600 unique visitors on a monthly basis. There are no negative or critical reviews concerning the site but with almost no customer care service in place, it is a bit difficult to determine its credibility. 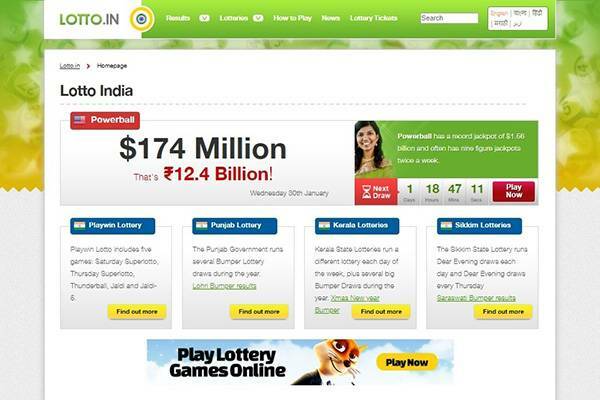 Lotto In offers a lottery platform for all Indians with the inclusion of big international games like Megamillions and Powerball. There is no federal law as regards to gambling in India but the state governments are autonomous and general gambling rules depend on the jurisdiction. Hence, gambling is permitted in some states while it is highly prohibited on others. In the gambling-friendly states, however, players must be up to 18 years of age before they can participate in lottery draws. However, international lottery games are not subject to Indian laws as draws are made outside the country and players can participate irrespective of their individual state gambling laws.